Over the past couple of days–but especially today–I’ve been a cleaning fool. I’ve even put away Hanukkah decorations (I know it’s not over til tonight at sundown, but I didn’t want all that stuff to be in the way of my dusting efforts, and we’re having a house full of people over on Sunday after the older boy’s Eagle Court of Honor, so it had to go away anyway.). When I got to the kitchen, I had to take a little extra time dusting my perpetual calendar, which IS currently on the correct month, thank you very much. The two Hot Wheels cars on the shelf were gifts from the boys ages ago, and that’s their place of honor. They’re part of a trio, actually, but not today. See where that “X” is marking the spot? 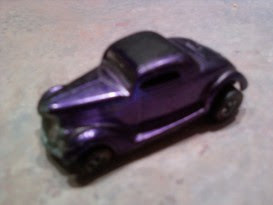 My third most-prized Hot Wheels car lives there, but I had to hide it today when I was cleaning. Why, you ask? Let me tell you about it. When Julesie and I were kids, we spent lots of time at our Grandma’s house, like kids do. Often our cousins were there at the same time; there were four of them, all boys. One of them is Julesie’s age, one is a year older than I, and the other two are a couple years older. 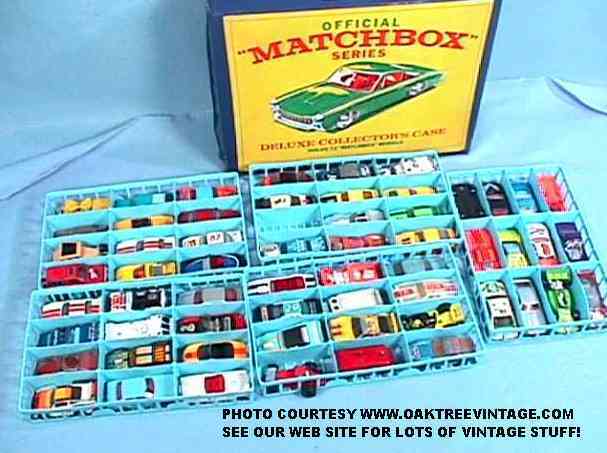 We always had a great time together; one of the things we loved to do was play with the cases of Hot Wheels and Matchbox cars that were kept at Grandma and Grandpa’s house for our visits. I think we had four little cases full of them, and they were made especially for this purpose, with the stacking plastic trays that had car-sized compartments. In fact, I found a photo of an identical storage case, here. We had a few favorite cars, and although I don’t recall ever really fighting over who got to play with the “best cars”, we always knew where they were at any given moment. Playing with the cars, along with my cousins, is one of my favorite childhood memories. Years later, when my grandparents died, the cars got divided up between us. I don’t remember how that happened or who did it, but what I do know is that I ended up with two of the best cars. One of them was a little green station wagon (Mercedes, I think?) and is packed up in a box, in my crawlspace. The other one? LOVE. 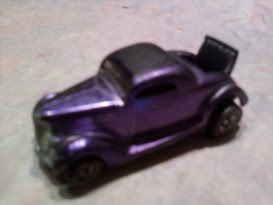 It’s a purple “Classic 1938 Ford Coupe“. Though some of the purple paint is rubbed off and the four wheels are permanently curved inward from too much rough handling by six children, it’s still adorable. But wait, there’s more…a RUMBLE SEAT! As I was saying, this car is currently in hiding. I have a good reason. One of the people coming over on Sunday after the Court of Honor is one of my cousins. Although he and his wife and kids live in the area, we don’t see them very often. When we do see them and the meeting happens to take place at my house, I hide the Coupe. 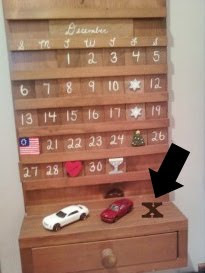 I have an irrational fear that my cousin, who is a good and decent person and not a thief by any means but has insane attention to detail, will notice the car sitting there on my perpetual calendar and try to figure out how he’s going to get it over to his house. Ridiculous, I know. Yet I still hide the car. On Monday, the car will be back on the calendar shelf where it belongs. Until then, I cannot divulge its location, so don’t even ask. I promise not to tell anyone that the coupe is parked in Weaselville. Oh wait, this was supposed to be a secret undisclosed location. Everybody just forget that I said anything. I wasn't even here. My boy collects Hot Wheels too. I think he has close to 2,000 now. I need to ask him if he has one of these, or something close. We might be able to donate it as a decoy car. With a rumble seat too? Sheesh! I'd be hiding it too! Heck, I don't know if I'd ever leave it out. You so make me giggle. I hope the Honor Court went spectacularly today. I can't wait to hear and see all about it! Outstanding job on Sunday. You have out done yourself again. I think I would have hid all 3! Those cousins can be pretty sneaky! Previous post: Can An Entire Salon Be Propositioned? Because I Think That’s What Happened.